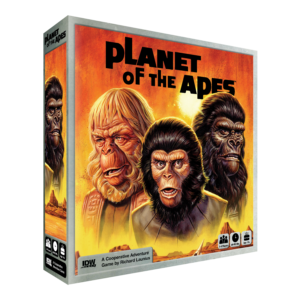 San Diego, CA (June 27, 2017) Ahead of the original film’s 50th anniversary, IDW Games and Twentieth Century Fox Consumer Products announce plans to bring the Planet of the Apes franchise to tabletops as a series of immersive board games. Starting with the classic film, Planet of the Apes follows the plot of the original movie and promises players a thrilling adventure in an unknown land! Designed by Richard Launius, the creator of Arkham Horror, Planet of the Apes puts 1-4 players on a crash course with feral foes, deadly environments, and unbridled psychological horror! In an innovative twist on the cooperative board game genre, each player takes control of one aspect of Colonel George Taylor’s psyche, and must work together to survive the Planet of the Apes! Planned as the first in a series of games based on the classic series of films, Planet of the Apes will be available October 2017 for $59.99. In celebration of this tremendous partnership and product, a FREE UPGRADE of 4 plastic figure markers will be packaged with every copy of Planet of the Apes, limited to just the first printing of the game. ← IDW Games Brings The Legend of Korra to Tabletop!